These three Gretsch sisters, Emilie, Wilhelmina and Dora had the same father, Jacob Gretsch. Jacob Gretsch was the son of Maria Dorothea Wild and Casimir Gretsch. Jacob was the third son of the couples six children. Jacob came to America in 1852. After the death of each of his wives, Jacob married again. Hence, each of his daughters had a different mother. Wilhelmina’s mother was Anna Artz was the sister of Emilie’s mother. Bertha Wintermantel was the mother of Dora Gretsch. To learn their stories read the time line below. 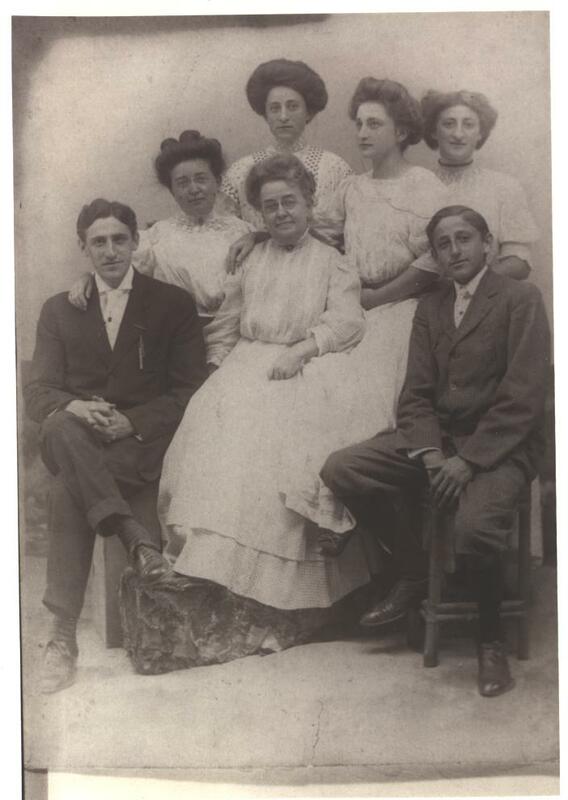 Dora, the youngest sister, stands in the back row next to her younger brother Ralph. Emilie, Jacob’s oldest child, sits on the far left in the stripped skirt. 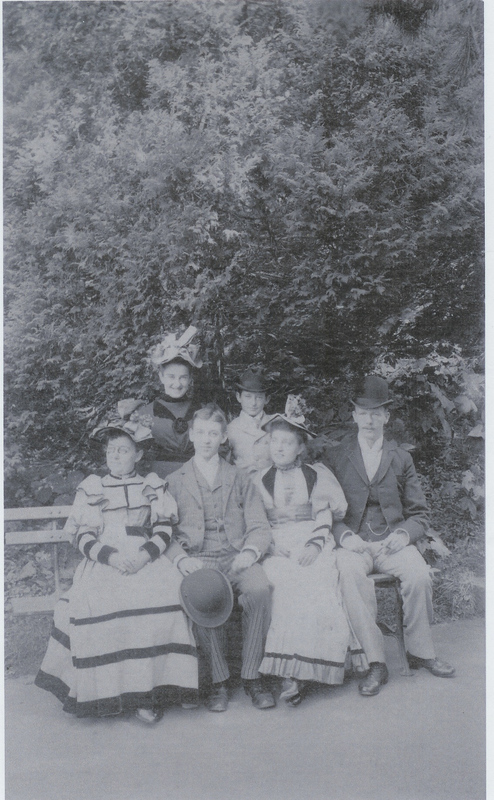 Wilhelmina sits between Herman and Karl Wintermantel, her mother’s brothers. Please note the various spellings of Emilie’s name in the following time line. It is interesting to note that the American poet, Emily Dickinson (1830-1886), signed her name “Emilie” to the manuscript of a poem written in her own hand. Apparently, Emilie Dickinson often spelt her name this way when writing letters. It is intriguing to think that our Emilie Gretsch and Emilie Dickinson had this same flexibility in common. In 1883, court papers at the time of Jacob Gretsch’s death refer to his daughter as Emily Gretsch. In 1892, guardianship papers for William, Dora and Ralph Gretsch, refer to their sister as Emilie Gretsch. In 1894, the name Emily Gretsch appears on mortgage papers when the family home at 970 Decatur Street was purchased. In 1917, “Emilie” is the spelling she herself chose to use in her article about the history of the Gretsch family in America. In May of 1922, Emily wrote her name, Emily Gretsch, as she signed an affidavit for her cousin Max O. Jordan. In 1936, she wrote her will and signed her name ” Emily Gretsch”. September 4 Casimir Gretsch, Jacob’s father was born in Simmern. August 1 Jacob’s mother, Maria Dorothea Wild was born in Orenstein. She was the eighth of ten children. Her mother’s name was Maria Elisabeth Klein. Dorothea’s father Karl Wild was a “goldsmith”, a jewelry designer. Dorothea came from a long line of jewelry makers who practiced their craft in the world famous gem city of Oberstien. Soon after his mother’s death, Jacob came to America. He was the only one of her children to travel so far. Emilie was born in Brooklyn in 1856. In this period, Jacob worked as an engraver. During the American civil war his designs embellished swords for Tiffany and Co, and other eminent jewelers. He had certainly carried with him to America, the skills of his mother’s family in Oberstein. January 21 Louis XVI was beheaded in Paris. Casimir Gretsch was Emilie’s, Wilhelmina’s and Dora’s grandfather. This story along with a longer history of the family appeared in 1917 in Schlegel’s German-American Families in the United States. For more information about this book and to read the entire essay which Emilie wrote in 1917 see the library section of this website. Casimir’s father, Johann George Gretsch was born in Simmern and came from a family of turners (lathe workers) and day laborers. His mother Fredericka Magdelene Kuss was born in Monzingen, a small town on the Nahr River, just south of Simmern. Her family had been for many years butchers which was at the time a very respected and honorable profession. 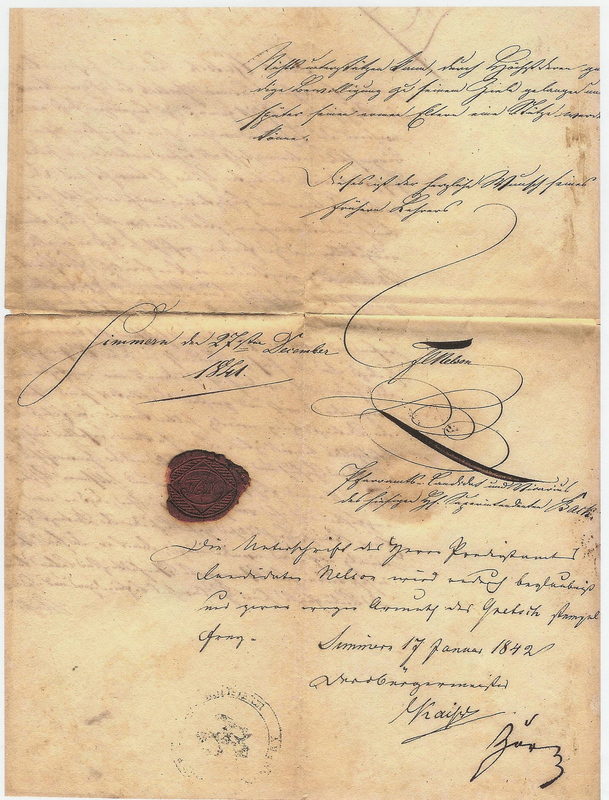 Johann Georg Gretsch and Friederica Kuss were married in Simmern on May 15, 1770. Casimir Gretsch was born in September 4, 1775 in his mother’s home town of Monzingen. He was named after his godfather, Casimir Kuss, a relative of his mother’s who was a himself a butcher. Casimir himself under the tutelage of his mother’s family became a master butcher. Records show ( see Ernst Siegel: “Handwerk, Handel, Gewerbe in Simmern” 1964 Rhein-Hunsrueck-Kalender) that in the 1800’s not only sheep and sheep herders traveled to Paris but also butchers. Such an undertaking would last about 6 weeks. It is quite possible that young Casimir as part of his apprenticeship traveled to Paris at the time of the French Revolution. Perhaps, he did stand nearby at the execution of Louis XVI but most assuredly, he stood nearby at the slaughter of many animals. June 4 Maria Dorothea Wild and Casimir Gretsch were married in Simmern. They were married just days before the Battle of Waterloo. Most likely, the couple had met in Monzingen. Casimir was born in Monzingen and his mother’s family was there. 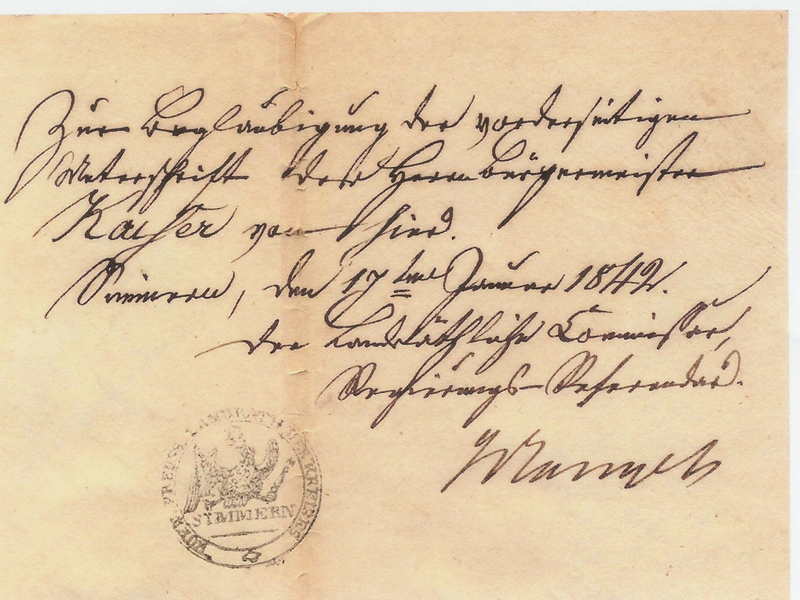 Maria Dorothea probably travled to Monzingen for the marriage of her brother Johan Karl. He married Maria Eva Philippine Rettig from Monzingen in 1812. This was Casimir’s second marriage. His first wife Elizabeth Auler died in April, 1814. Casimir had two daughters from his first marriage. Juliana Catharina who was 10 years old and Marie Elise who was 5 years old when their father remarried. November 6 Emilie’s mother Rosina Maria Blondina Artz, born in the city of Treves (Trier) Rhenish-Prussia, Germany. There she was educated and reared to womanhood. August 21 Emilie’s, Wilhelmina’s and Dora’s father Jacob Gretsch born in Simmern, Germany Son of Casimir and Dorothea Wild Gretsch. He was the third son of the couple’s six children. Only four children would grow to adulthood. Jacob would travel the furthest from home. He was the first member of the family to come to America. Many of his nieces and nephews would follow him to Brooklyn. In September of 2001, the documents below were sent by Lynne Francisco Swarz, great granddaughter of Jacob Gretsch to Sally Gretsch Coulson. 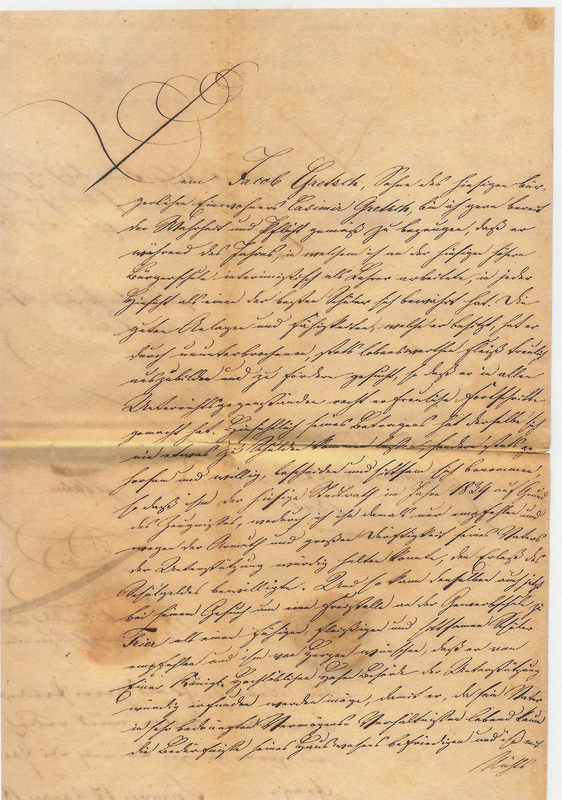 Sally, also a great granddaughter of Jacob Gretsch, scanned the ancient documents and sent them by email to Gretchen (nee Gretsch) Elsner-Sommer. 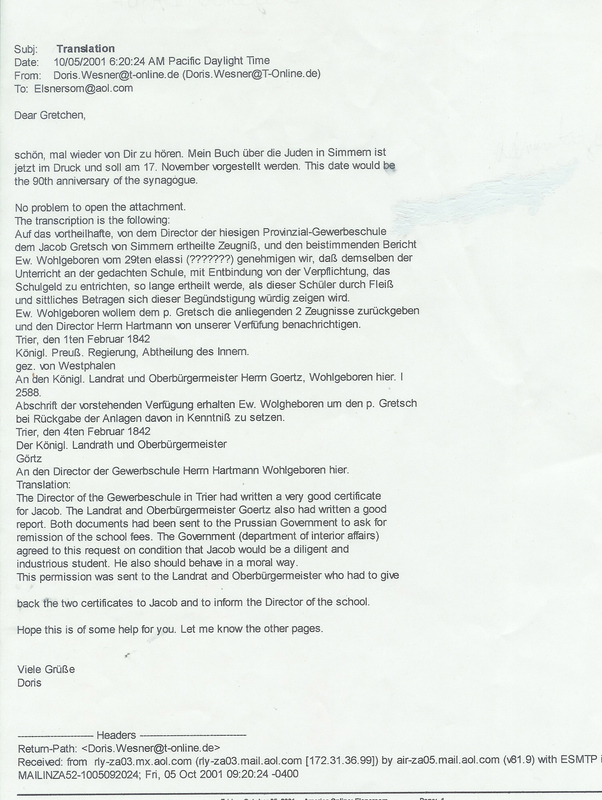 Gretchen sent the scanned documents onto Doris Wesner in Simmern, Germany, Jacob’s hometown. Doris transcribed and translated them. gelangen und später seinen armen Eltern eine Stütze werden könne. Dieses ist der herzliche Wunsch seines früheren Lehrers. Pfarramts-Candidat und Vicarius des hiesigen H. Superintendenten BACK. und zwar wegen Armuth des GRETSCH stempel frey. Simmern, den 17ten Januar 1842.
later to be able to support his poor parents. Jacob was a student at the “Koenigliche Provinzial-Gewerbeschule” in Trier. It is interesting to speculate about just how much Jacob Gretsch knew about Karl Marx when Jacob first came to Trier. They were both young men, Jacob was 18, Marx was 24. Perhaps, knew nothing about Marx when he first left Simmern. Surely, he learned more about him as Jocob settled into his new life in Trier. Karl Marx was born in Trier on May 5, 1818. “Marx was descended from a large family of Talmudists and rabbis spread all over Europe. His uncle Samuel was a rabbi in Trier until 1827. In 1808 when Napoleon I, demanded permanent family names also for Jews, Samuel took the name of Marx. Karl Marx and his Contemporaries, Guide book to the permanent exhibition in the Karl Marx House, Trier. Although, Karl Marx himself no longer lived in Trier by the time Jacob arrived, Jacob was no doubt aware of the ferment that Marx and his contemporizes were causing across the region. Karl Marx’s family still lived in Trier when Jacob arrived. Karl no doubt returned often to visit his fiancée Jenny von Westphalen whom he would marry in 1843. In 1842, Karl Marx began his work as a political journalist at the Rheinishche Zeitung in Cologne. October In 1842 Marx became political editor for the Rheinishche Zeitung . early The Rheinishche Zeitung is suppressed by the Prussian state censorship because of its radical democratic tendencies. June 19 Karl Marx married Jenny von Westphalen who also lived in Trier. October Karl and Jenny leave Germany for Paris. March 3 War between Denmark and Schleswig Holstein. Denmark wanted to Annex Duchy of Schleswig. Frankfurt Parliament intervened and commissioned Prussia to send Federal Troops. During this year of revolution across Europe, there is no record of just where Jacob was living. February 9 Emilie’s parents, Jacob and Rosina Maria Blondina Artz were married in Trier. July 22 Jacob’s mother, Maria Dorothea Wild Gretsch died in Simmern. February 12 Jacob’s infant daughter Rosina died in Trier. 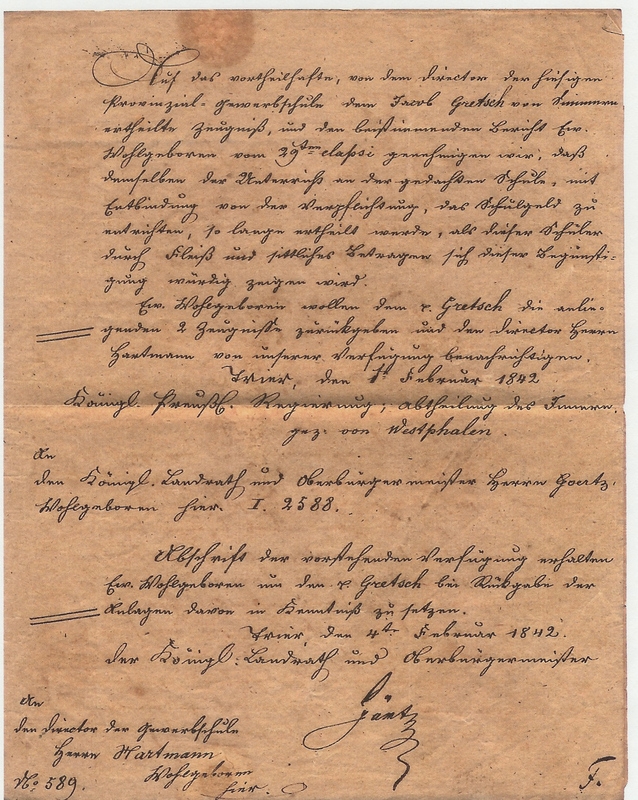 December 15 Jacob singed a death certificate for his stillborn daughter in Trier. However, wedding, birth and death documents place Jacob in Trier in this interim period. Many German revolutionaries of 1848 did go to Belgium after the failure of their cause. Perhaps, Jacob identified with that group especially after he came to America. Maybe that was the story which Jacob told and his daughter. This was the story that was written down. Records seem to indicate otherwise. April 22 Jacob B. Gretsch arrived in New York from La Harve on the “Gallia”. He was listed as a farmer from Wurtenburg. She is listed as 20 years old. If she is Emilie’s mother, she is actually 32 years old. These dates do not coincide with the dates I found. However, their very preciseness is of interest. Emilie does not write so precisely about the journey to America of any other of her ancestors. The journey of her mother is the only one in which Emilie records the precise dates. Emilie who was only four years old when her mother died, obviously held on tightly to the few things she knows about her mother. Emilie was meticulous in passing them on. March 12 Emilie born in Brooklyn. This was the third daughter of Jacob and Rosina and their only child to survive infancy. June 27 Anna Artz, sister of Emilie’s mother, arrives in New York from La Harve “William Tell”. This embedded homage is the only indication that Emily Gretsch was the writer of this History of the Gretsch Family which appeared in Schlegel’s German-American Families in the United States. For more information about this book and the essay that Emilie wrote in 1912 see the library section of this website. In these years, so soon after his arrival in America, Jacob might have been very close to many German revolutionaries who had fled Germany and were living in the Williamsburgh section of Brooklyn. September 23 Rosina born to Jacob and Rosina. May 13 Cousin Friederich Gretsch born in Mannheim. He is the third son of Emilie’s uncle Wilhelm. January 1 Baby Rosina dies, aged fifteen months. This is the 3rd little girl of Rosina and Jacob who died in infancy. Emilie is their only child to survive. Emilie’s mother, Rosina Artz Gretsch dies. Emilie is four years old. April 29 Brooklyn celebrated the inauguration of its newly conpleted water supply. (It was considered civic duty in the 1860’s to visit the Ridgewood Resevoir and see where the City Water came from. Jacob lived at 28 Miserole St.
Jacob lived at 28 Miserole Street, occupation engraver. Not found in the New York State Census index of this year. April 19 7th Regiment marched down Broadway in Manhattan as they departed New York. ( Jocob’s) skills as a designer and engraver secured him a large amount of engraving and etching on the blades of swords and other military articles which were sent to him by the firms of Ball and Black and Tiffany and Company, at that time the leading houses of their kind in New York City”. Heritage, 1960 In the years to come, Ball and Black became “Ball, Black and Company” and latter “Black Starr and Frost”. In the picture at left is pictured the Ball, Black and Co. building on Broadway and Prince Street. The building was used from 1860 until 1876. Thomas Nast’s painting on the left also gives a good idea of the energy of the time. July Lincoln called for 300,000 volunteers for a 3 year term. July 14 The New York Times reported that wounded soldiers arrived at the foot of Montague street and were taken to the Long Island College Hospital at Henry and Pacific. This was not far from where Jacob lived with his family. Imagine hearing these guns every morning. It must have beeen frightening and brought the war very close to home. July 13 New York Draft Riots, many negros were killed. This was the largest civil disturbance in American History to date. Two grain elevators in Atlantic Basin set on fire by a mob of 200 during the Draft Riots. Feb. 22 Opening of Brooklyn and Long Island Sanitary (Health) Fair (did Jacob and Emilie and Annna Maria Artz go?) To raise money for troops. Held at Brooklyn Academy of Music on Montague Street. May 17 Emilie’s cousin, August Gretsch (born March 22, 1847) signs up to serve in the US Army. Perhaps, August stayed with Emilie and her family when he came to America. Records of his enlistment can be found on film M551 roll 56 in the US Civil War Records. He enrolled in the 58th Regiment, New York, Infantry. They list his name as August Kretsch. The following information is from the website of the New York State Military Museum. Emilie gives her cousin August only slight mention in her Gretsch History. ” August who came to the United States and migrated to the west where he finally settled.” Why did she not mention him and his large family. Perhaps, because he changed his name to Joseph Powers. He was the second son of William Casimir Gretsch and Johanna Catherina Fick. They were married in Speyer on September 3, 1845. Their first son William was actually the older brother but Emilie lists August as the older brother in her history of the family..
May 18 Casimir Gretsch dies in Boppard. He is 88 years old. His youngest son Karl Gretsch signs the death certificate. He was the youngest of Casimir’s children and apparently stayed closest to his father. November 11 The New York Times reported that Lincoln had won the election. April 14 Good Friday evening, Lincoln was shot. April 15 The news of the assassination hits the papers and spread quickly around the country. 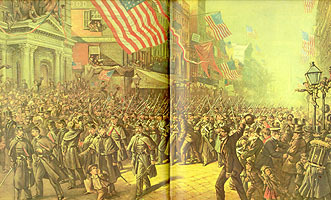 April 20 This day was first designed as a day of rejoicing in the Union’s victory. Instead, it became a day of National mourning. Monday, April 24 Lincoln’s body arrives in New York at 10 am and is transported to City Hall. On Tuesday, a large parade accompanied the body to the train station. As the article below describes how New Yorkers responded in ways “both large and small” to the sad news. Emilie, 11 years old quite possibly attended these momentous ceremonies with her father< Jacob. The following op-ed piece which appeared in the New York Times April 17, 2009 offers a good description of the New York City at the time of Lincoln’s death. WE’VE never really gotten over Lincoln’s assassination, 144 years ago this week. The news came quickly, but the full import of the deed — a sordid attack upon democracy at a most vulnerable moment in our history — took longer to settle in. Early in the morning on April 15, the first reports flashed with lightning speed along telegraph lines and railroad tracks throughout the newly united states. Twenty years earlier, it would have taken New Yorkers more than a day to know. Now the facts were instantaneous and overwhelming. By 3 a.m. Northern cities had heard of the shooting; by 8 a.m. they knew the result. The news was slower to reach the hinterland, especially in the South, but crape-bedecked steamships plied the Mississippi, neighbors shouted over fences and eventually the word reached all Americans. In Charlotte, N.C., a fleeing Jefferson Davis received the news by telegram and understood that it augured disaster. Southerners foolish enough to express approval suffered fierce reprisals from Northern troops, and the week that followed saw episodes of mob violence, along with unprecedented displays of religious activity. A Boston minister wrote, “More people united in public worship of God in this land than ever united in such service before.” San Francisco held the largest funeral the West Coast had ever seen. Up and down Broadway, and all the other arteries and capillaries of the city, shopkeepers designed makeshift shrines to the martyred president. An anonymous diarist walked for miles, drawing sketches of as many storefronts as he could (evidence suggests, but does not confirm, that the diarist was a man). Through his relentless activity — going down one street, then another, incessantly writing — this nameless reporter made the news a bit more comprehensible. The Last Brooklyn regiment returned. Alice James & Aunt Kate arrive in NYC 1303 Broadway near 35th st at Dr. Charles Fayette Taylor’s house so Alice could be treated for her maladies. Jacob married Anna Artz, the sister of his first wife. No record can be found for the marriage. William Gretsch comes to America. He is the eldest son of Wilhelm Gretsch in Mannheim and first cousin to Emilie. Jacob Gretsch not found in the census indexes for Brooklyn, Manhattan and Long Island. Ice blocked the east river between Brooklyn & New York, one could walk or skate across. September Emilie began teaching in the public schools of Brooklyn. Emilie writes that her first assignment was in Grammar School #18 and later she taught in Grammar School # 33 and Grammar School # 122. She was for many years actively involved in her chosen profession, teaching in the public schools of the city of Brooklyn. She became thoroughly conversant with several languages and well versed in music. After having taught for 41 years she retired from active work and resides at 670 Decatur Ave.
Cousin Karoline Pauline Gretsch from Boppard came to US on board the ship “Vandalia”. Pauline’s father Karl, was the younger brother of Jacob. Pauline was a first cousin to Emilie and Wilhelmina. 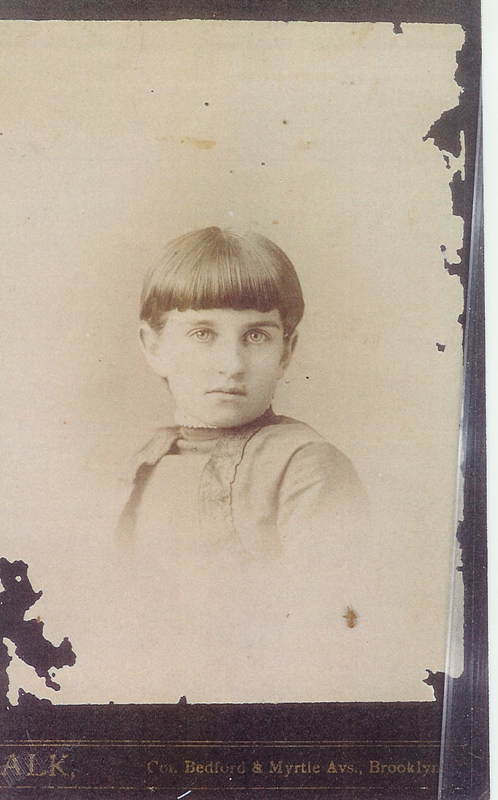 Pauline’s mother had died in 1860 when she was only four years old. Like Emilie, both cousins had lost their mothers when they were four years old. It is very possible that Pauline spoke French. Her home was close to the French boarder. Pauline was the first Gretsch woman, the first granddaughter of Maria Dorothea Wild to come to America. It is odd that Emilie, who is so engaged in family, writes so little of her first girl cousin to come from Germany. Perhaps, there was some not so good feeling between them. The 1900 Census shows a Pauline married to a Henri Evers. Their marriage license from 1895 however shows that this is not Pauline Gretsch. Rather, Pauline Klam Evers born in Luisianna. Had Pauline Gretsch completely changed her identity? It is interesting that Pauline Klam was from Louisiana where French was spoken. There is an older child in the household Louise born in France in 1883 before the 1895 marriage of this Pauline and Henri Evers. It is interesting that the records found about Pauline are so French identified. No other part of the Gretsch family is so identified with the French language. No other record of Pauline Gretsch has been found. Unless of course, she is the Pauline Evers of the 1900, 1910, and 1920 census. That Pauline was born however in Louisiana. It is very odd that Pauline born in Boppard would have left the family so completely. In August of 1883, Pauline Evers is show coming into the USA. She is 19 years old and born in Germany. Perhaps, Pauline was sent for to help with Jacob’s family. Emilie was working as a teacher and Wilhelmina was only a baby. Pauline might not have gotten along with her American family and been more of a hindrance to the peace of the family than a help. Perhaps, Jacobs wife Anna was already sick at the time of Pauline’s arrival. Karoline Pauline Gretsch is a mystery. Anniversary day brought thousands of School Children for a parade. Emilie surely must have been a part of this yearly celebration. Anna M.Gretsch died of apoplexy she was 41 years old. The family was leaving at 329 South 2nd Ave..
Anna buried in Plot # 427 Cedar Vale at The Evergreens Cemetery in Brooklyn. It must have been a really hard time for Emilie to lose Anna. Wilhelmina was only three years old, about the same age that Emilie was when her mother died. In 1883, Emilies father Jacob would be buried there. In 1892, Bertha, Jacob’s third wife would also be buried there. In March of 1938, Emily’s ashes would be buried there. Emily died on January 15. There is large white stone on the grave. Anna is the first to be buried there. Emily’s name is not on the stone. The stone was obviously placed there sometime after Bertha’s death. When I was there in 2002 (?) with my sister Katie, there were plastic lily’s of the valley in front of the grave. Katie said that seh thought they were placed there by someone who just went around living flowers at graves that didn’t have any, but I imagined differently. At the time of Anna death, Emilie was working as a school teacher. Cousin Pauline Gretsch from Boppard was possibly living with the family, helping care for Wilhelmina. Brooklyn Tabernacle, Presbyterian church, destroyed by fire. Did Fritz really arrive on his birthday! Fred Gretsch (age 16) arrived in America at Castle Garden. Friedrich (Fritz) cousin of Emilie comes to America. this is her third male cousin to come from Germany. William and August had already arrived in America and were quite established here. Emilie is 19 years old. It must have been very exciting for her to have these handsome cousin come from Germany. Or did she find it tiresome? Fritz was obviously her favorite for it was Fritz she focused on in her family history. Emilie believed that was Fritz the most successful member of the family here in America. He was also the closest to her in age. He probably went to his Uncle Jacob’s house at 329 South Second Street. Perhaps, he stayed with his half brother William who ran a liquor business at 98 Fulton Street and lived at 16 St. Marks Place in Manhattan. Perhaps, the family thought was that Fred would work for his older brother in the liquor business. Fred, had several close relatives who had already come to American. His older cousin Pauline had come two years earlier. Pauline was the daughter of Karl Gretsch and was born in Simmern in 1856. He had uncles on his mother’s side and his father’s side who had already settled in America. Fred also had two first cousins, Emilie born in 1856 and Wilhelmina born in 1869, who like Rosa were born in Brooklyn of German born parents. Over the years, Emilie and Rosa both very strong women and both very focused on the family would have gotten to know each other well. It is interesting to speculate on the relationship between Rosa Gretsch and Emilie Gretsch. Fritz’s mother’s brothers was also settled in California when he arrived in America. Trial of Henry Ward Beechen sued by Harry Ward Telton on a charge of alienating his wife’s affection. He was vindicated by public opinion. Incredible trial. The sensation of all the newspapers. Emily must have read about it. Jacob marries Bertha Wintermantel born April 1, 1845 in Baden Wurttemberg, Germany. Jacob’s brother William dies in Mannheim. Three of his sons, August, Wilhelm and Fritz had already arrived in America. After his death, all of his other children would find their way to America. Louis Gretsch, another son of William Gretsch arrives from Germany. 100th Anniversary of US. There must have been big celebrations. Brooklyn and NY connected-footbridge engaged so tourists can cross for 1 Penny. Fire in Brooklyn theater, several hundred killed because of faulty fire doors. Washington ST.& Johnson ST.
Jacob’s nephew, William Gretsch was married on Ocotober 16, 1877 in Manhattan to Marie Rittmuller, Her mother’s name was Charlotte Enders and her father’s name was Carl. She was born in Germany and was 34 years old. William was 32. They both lived at 23 Waverly Place. The witnesses were John A. Fuchs and Adolph Mayer. On June 1, 1872 William’s father had married in Germany a Justine Fuchs. Is this witness perhaps related? Adolph was listed in the 1880 census as living with his wife Carrie age 22 born in Illinois. They are listed as boarders on East 50th Street. He is a wine merchant. Emilie’s cousin, Pauline Gretsch from Mannheim sails for America from Hamburg on “Gellert”. Most likely she goes to live with the family of her uncle Jacob Gretsch. He is now married for the third time to Bertha Wintermantal and has a nine month old son. His daughters from his earlier marriages still live with him. Emilie is now a school teacher and Wilhelmina is 8 years old. Emilie, is promoted to a vice teacher in the first grade of primary school. Brooklyn Eagle. On this same day, another cousin Philippine ( Bena ) sails to America from Hamburg on the “Lessing”. Second Class. Passenger # 14 Philippine with a very beautifully written “P” from Mannheim. I couldn’t help but wonder if the man writing in the name of the oncoming passenger had been really intrigued with this young beautiful woman. I thought of Maggie and Mary and Heather at this age. I thought that his special care with the formation of this letter “P” could have been influenced by his infatuation with the girl herself. Or perhaps, she had written her name herself and had quite a flourish to her penmanship. Passenger# 13 Clementine Cahn 28, Gehans. Passenger # 15 George Beck 18, New York. Bena arrives in New York at Castle Gardens. She was pretty brave to take a winter crossing of the Atlantic. Bena had lots of siblings and cousins in New York. Perhaps, she went right away to her uncle Jacob’s home. Or perhaps, she went to her step brother, William Gretsch’s home. She mostly came to help her Uncle Jacob with the care of his family. Emilie was probably glad to have more help in the household or perhaps, she was getting tired of all these cousins moving in. Dora is born to Jacob and Bertha Gretsch. On this date, Philippine’s sister, Paulina is married to Conrad Benzing. Ernst Lasch was head of a German singing group of which Emily was a member. He attended this picnic and perhaps, Emily did too. Ralph Gretsch born. It must have been a busy household on Lewis Ave with three young children. Cousin Fred Gretsch (22) married Rosa Behman Schnapauff (22). Frederick Kilian and Louis Gretsch are witnesses. In Scotland, the Tay Bridge collapsed in a storm only 19 months after its completion. This bridge was a modern wonder and its unexpected failure shocked the world. Surely, the young married couple read the news with great amazement. “Tand, tand ist das Gebilde von Menschenhand” is a line from Theodore Fontane’s poem “Die Bruecke am Tay” written in 1887 which told of the disaster. According to the Brooklyn census, a 14 year old niece lives in the Household of Jacob Gretsch. Most likely this is Philippine Gretsch, the youngest of the girl cousins from Mannheim. Philippine or Bena as she was known was actually 19 years old. The census record was also wrong in recording 2 year old Dora as a son. Also in the household of Jacob Gretsch, age 54 was his third wife Bertha age 45. Daughter Millie, age 26 school teacher, daughter Minna, age 11, in school, son Willie age 3, son Dora age 2, and son Ralph age 6 months. They were living at 102 Lewis Ave.
To see an enlargement of this birth certificate, click on the image. Cousin’s Fred and his wife Rosa’s first child “Fred” is born (Physician/Midwife- Dr.Rebmanny). Fritz is listed as a “wholesale grocer” on the birth certificate. The baby is born at the same address as Rosa’s parents. Apparently, the young couple have moved in with Rosa’s parents. Note, that Rosa is listed as 23 years old born in 1856. According to the US Census of this year, Rosa and Fritz are living at 200 South 5th Street in the same building as Rosa’s parents. Their son is 3 months old. Fritz is employed as a bookkeeper in a music store. Rosa’s father is employed as a “picture color”. Perhaps, he hand painted photographs. Also living in the same building was Alexander Gumpert and his wife Cecila and infant daughter. William Gretsch is listed as a wine merchant at 37 4th Street in the Eastern District. April Pauline Gretsch and Konrad Benzing first child, Pauline, is born in New Jersey. 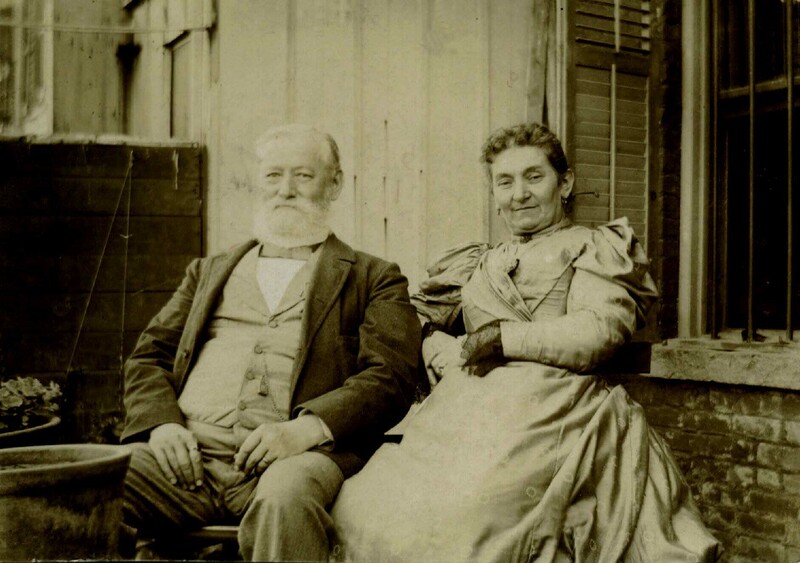 This picture of Jacob and Bertha Gretsch was taken circa 1880. April 8 Fred and Rosa Gretsch’s second son , Walter is born. This picture of Dora was probably taken when she was about 4 or 5 years old. Pauline Gretsch Benzing gives birth to her second daughter Wilhelmine in Hoboken, New Jersey. Brooklyn Eagle ” The Rev. Henry H. Washburn, the newly installed rector of St. Barnabas’ Church (Bush Ave and Kossuth place), will conduct his first festival service in that parish on Easter……This programme will be interpreted by Miss Hattie Smith, soprano; Miss Emilie Gretsch contralto; Mr. Marmaduke R. S. Holgate, tenor and Mr. E. B. Tompkis, bass who constitute the quartet choir of St. Barnabas. This short article along with one from May 6, 1891 point to the fact that singing was a big part of Emilie’s life. One wonders if Emilie was also involved with one of the many singing clubs which were so much a part of the social life of the German community in Brooklyn. The article of 1891 points back to the possibility that Emilie and Wilhelmina were very much involved in the singing societies of their home town of Brooklyn. Emilie’s father, Jacob Gretsch dies at 102 Lewis Ave.
Years later his oldest son, William Gretsch, remembers the household at the time of his father’s death. William wrote this following letter in September of 1961 and mailed it to his granddaughter Lucille just 13 days before he died. He is remembering back almost 80 years! Please note that Tante Bena came to care for the children after Jacob’s death. Perhaps, she came from her sister, Pauline Benzing’s home in New Jersey. Pauline had had her second daughter just months earlier. Well believe you me you talk about a disciplinarian, a real “Hun”. A large tub was put on the floor of kitchen (no bath rooms) at that time) Willie- Dora – Ralph-get up come down for your wash- 3 flights of stairs and she watched you while you washed-regardless of weather down trotted for your daily wash,- Emilie and Minnie where too old for her to Boss around. Jacob Gretsch is buried at the Evergreens Cemetery, Cedar Vale #247, Brooklyn. He is buried with his second wife Anna Gretsch who had died 11 years earlier. Nine years later, Bertha would be buried beside him. Fifty five years later, exactly to the day, the ashes of his oldest daughter Emily would be buried their also. The bright white headstone on the grave only lists Anna and Jacob. The inscriptions are written in German. Gretchen Elsner-Sommer (nee Gretsch) and her sister Katie Cuddeback visited this grave in 2004. At that time, the very white head stone stood out among the others stones which seemed slightly grey. Perhaps, the stone is really marble. Also, someone had laid a sprig of plastic Lillies of the Valley in front of the grave. I think that address is incorrect. According to Brooklyn Directories, the Middleton address for the Frederick Gretsch banjo business did not appear until 1890. Before then, the business was Fred Gretsch Drums at 134 1st Street. “Build by the Albert Houdlett and Son drum and banjo company. From what I understand, the Albert Houdlett & Son company started business in Brooklyn, New York, about 1865. They originally produced drums, then later added banjos to the line, which included “Lynbrook”, “Nu-Art” and “Nu-Way” Banjos. Around 1883, one of their employees, Friedrich Gretsch, left the company to form his own business. Fred Gretsch Mfg. Co., (also in Brooklyn) who made many instruments, but specialized in ( and is still know for) drums. The Gretsch company is still in business today. The Albert Houdlett and Son drum and banjo company closed its doors around 1930. Emily Roebling was the wife of the chief engineer of the Brooklyn Bridge. After he became too ill to travel to the bridge site, Emily became his chief contact with the work being done there. David McCullough’s “The Great Bridge”. Emilie Gretsch still in grief over her father’s death, must have taken note of this intelligent, brave woman who shared a name with her. Perhaps, this is when she started thinking of spelling her name ” Emily”. May 24 Brooklyn Bridge opens. Longest suspension bridge in the world. Speeches and 14 tons of fireworks exploded! Everyone had the day off. President Chester Arthur was here. Governor of New York, Grover Cleveland was also there. Emily I’m sure walked across the bridge with her younger siblings and cousins. They all dreamed dreams about their future in America. At a time when the tallest buildings were 6 stories high, the view from this bridge must have seemed like the view from a mountain top! The bridge must have been a big part of their lives and their dreams! Fear of collapse, causes Panic on Brooklyn bridge, one week after its opening. Twelve people died and 30 are injured. Perhaps the crowd remembered the collapse of the Tay Bridge on December 28,1879. Perhaps, this is what caused the panic. Bertha Gretsch, widow of Jacob petitioned the surrogate court of Kings County “In the matter of Application for Letters of Administration on the Estate of Jacob Gretsch.” His property did not exceed five hundred dollars. Living in the household at the time was Bertha 34 yeras old, Emily 29 years old, Wilhelmina 14 years old, William age six years, Dora age 4and Ralph age 3 years. Auguste Katharine Gretsch von Hellerman gives birth to a daughter in San Diego California. Auguste Katharine is a cousin of Emily’s from Mannheim. She is the 4th of the nine children of Anna Maria von Gerichten and Wilhelm Gretsch. Emily would write about her sparingly in the Gretsch history. Emily neglects to write that Helma was born in America. Katherina was no doubt living with her mother’s family in San Diego when her daughter was born. Louis Gretsch becomes a citizen of the United States. Louis is living at 58 East Third Street in Manhattan. William Gretsch, Louis’s older half brother is his sponsor. William is living at 247 Vernon Street in Brooklyn. Peter Karl von Gerichten dies in San Diego. He was a very successful business man. Two more young cousins, Philip and Jacob Gretsch arrive from Manheim. The Exhibition of pupils of the Eastern District Turners’ School at Turn Hall on Miserole Street last evening was largely attended by parents…….All were under the direction of Professors Carl Stahl, Theodore Speth, Ludwig Horals and the Misses Dillhof, Lothrington, Shulte, Harrison and Gretsch. Brooklyn Daily Eagle Front page. Wilhelmina T. Gretsch graduates from PS 25 on Lafayette Ave near Sumner. After an illness of two months, Pauline Gretsch Benzing, the first cousin of Emilie, Whilehelmina and Dora dies at the Gretsch home on Lewis Ave. She had come to Lewis Ave most likely to be nursed by her sister Bena who was living there at the time. Pauline’s husband Conrad Benzing and their two young daughters, Pauline and Wilhelmina live in Hoboken, New Jersey. Pauline is buried at the Evergreen Cemetery however not in the same grave as her uncle Jacob. In 1892, Bena’s 4 month old son is buried with Pauline. In 1898, Bena’s husband is also buried with her. 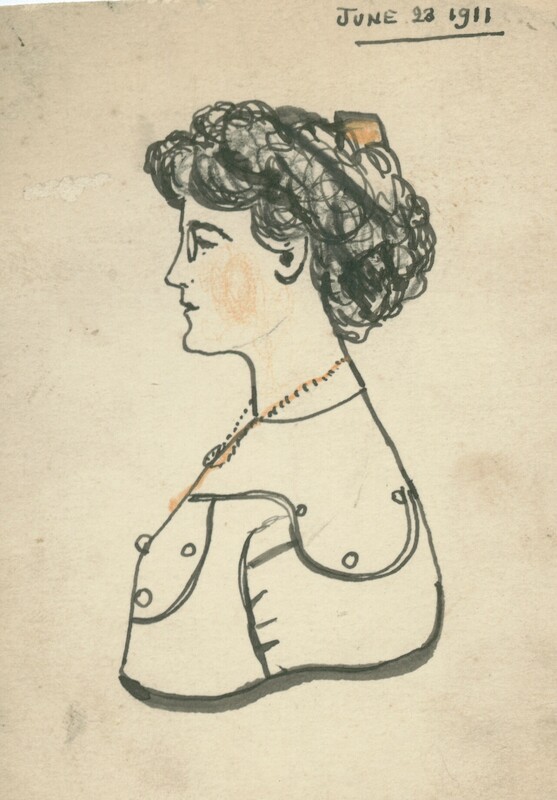 Circa 1890, Conrad married Bertha Wintermantel’s sister, Emma. May Bena Gretsch, a cousin of the Gretsch girls who had been staying with the family since their father died, returned to Germany. Fire in Havermeyer Sugar Refinery putting thousands out of work. It was probably around this time, in the mid 1880’s that Bertha Wintermantel’s family came from Germany. The Gretsch family was stilll living on Lewis Ave when Frank Wintermantel and his sister Anna Wintermantel (Jordan) came to America. In the fallowing years, both Anna and Frank were instrumental in helping their mother, Ursula Wintermanel, and their younger siblings Hermann, Carl and Emma come to America. Soon after they arrived, Frank left for Mexico. Bertha who was then a widow with three children and her sister Ann, known as Aunt Jordan had to take care of them all. The Blizzard was obviously part of Dora’s memory of these hector days of family arriving and moving to a new home. She was not yet 10 years old and would have been alert to all the disruption in the family. Frank leaving for Mexico, the family moving, Emily and Wilhelmina living elsewhere and Emma leaving the household. Perhaps, it was during the Blizzard or soon afterwards that Emma Wintermantel and Conrad Benzing, the widower of Pauline Gretsch began their relationship. Their marriage soon afterwards shows the close relationship among the cousins of the Gretsch family. Emma who was no doubt a hardship on her mother and older sisters, was much needed in Hoboken, to take care of Conrad and his two young daughters, Pauline and Wilhelmina. Emma and Conrad married circa 1890. A 1892 New York State Census shows Bertha and her children William, Dora and Ralph living at 340 Stockton. Ursula and Herman also live there. “…the first edition of Dickinson’s POEMS sold out rapidly through eleven printings in 1891” Joyce Carol Oates, “In Rough Country”. I wonder if Emilie Gretsch purchased a copy. She surely knew of her. 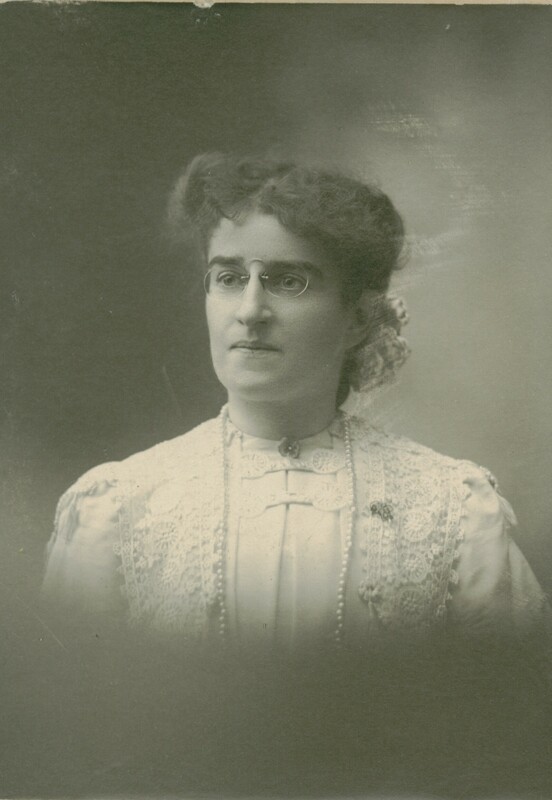 Emilie Gretsch was a school teacher. March 6 Frederick Gretsch applies for a Patent for a banjo. Emily Gretsch along with her sister Wilhelma and their cousin Carl Gretsch also sang in this concert. It is not clear from the article which Miss Gretsch sang the solo. Carl Gretsch was also an archivar (archivist ?). The concert was held at Zoeller Mannerchor Hall, 977 Broadway. Ernst Lasch was the president of the new society. His name can be found prominently in several article about singing clubs in Brooklyn. ( see June 23, 1879 in this time line.) He lived at 903 Willoughby. Emilie Elder is the vice president of the society. She was another woman who spells her name Emilie. It must have been a common spelling in those circles. June Emily’s cousin, Bena Gretsch Morgner gives birth to her first daughter, Johanna. July 14 A U.S, Patten is awarded to Frederick Gretsch for a banjo. November 1 Louie Gretsch’s daughter, Olga is born. November 22 Rosa’s youngest child Herbert is born. Bertha Wintermantel and her children, William, Dora and Ralph were living at 340 Stockton. Also living there were Ursula Wintermantel and her son Herman Wintermantal. This was taken before Bertha’s death on March 28th. Later in court papers Ursula Wintermantel was living at 73 Melrose Street. In those same papers, Emilie and Wilhelmina were living at 33 Central Street. According to the New York State Census of 1892, Philippina, Max, their daughter Johanna lived at 319 Marcy with Bena’s brother Jacob Gretsch. Max was an “engraver” and Jacob made “surgical instruments”. Perhaps, the census taker misunderstood and “musical instruments” was his trade. July 2 Emilie ( NB the spelling of Emily’s name )and Wilhelmina were living at 33 Central Place in Brooklyn. They were served papers to appear in court on July 12th. Philippine Morgner and Philippine Gretsch are both mentioned as being served with papers on this day. Presumably, this is the same person. This was a Saturday and Philippine Gretsch was served papers at 319 Marcy. Philippine Morgner was left with the papers for Jacob Gretsch at 319 Hart Street. This was the home of William Gretsch, the successful half brother of Philippine. At the time Philippine was very pregnant with her second child who would be born in July. She also had a one year old. This day, she was literally in two places at one time. Dora went to live with Emily and Wilhelmina. August Louis and Clara Gretsch’s third daughter is born. The weekly journal SCHOOL (written for NY school teachers, chatty and informational, edited by H.S Fuller) provides a good account of the professionals distaste for centralization and reform. April 4 Emily Gretsch and Wilhelmina T. Gretsch take a mortgage on 670 Decatur Street. The mortgage is from A. Stewart Walsh for $750.00. NB In these papers, the name Emily Gretsch appears. April 28, Sunday Emily’s cousin, Fred died in Hamburg from cholera. He was 39 years old. Fred’s older brother William was living in Manheim at the time and had come to Hamburg, perhaps to meet his brother as he arrived. William signed his death certificate. was der Anzeigende aus eigener Wissenschaft bezeuge. 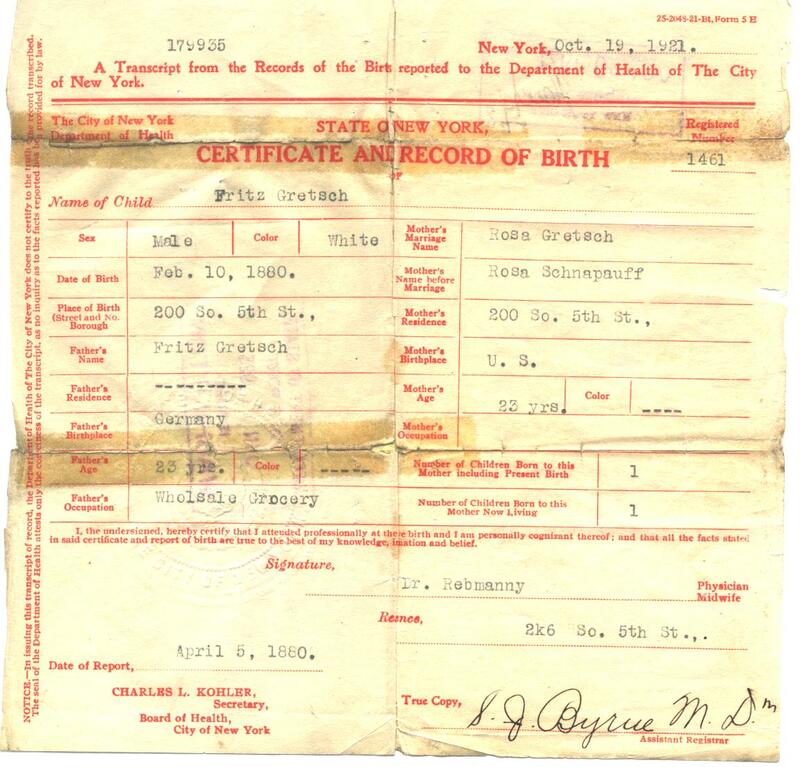 This death certificate was found in the New York archive in 2003 by Mary Ann DiNapoli while doing research for Gretchen Elsner-Sommer, Fred and Rosa’s great granddaughter. Transliteration of the text was done by Bettina Höcherl of the Landesmuseum für Technik und Arbeit in Mannheim. Music Trades writes circa 1973, “At the time of his death (Frederick Gretsch, 1895) the firm was still small with only a dozen employee in a small wooden shanty converted from a stable on S. 4th Street. George Seidenzahl of 23 Broadway and Louie Gretsch of 20 Vernon Ave were the executors of Fred’s will. Fred left $18,000 worth of Real Estate and $8,000. worth of personal property. George Seidenzahl died on Dec 29, 1899. He was 38 years old. November 27 Fred Gretsch was buried at Greenwood Cemetery. It took quite a while to retrieve Fred’s body from Europe because of the cholera epidemic. When Fred’s wife Rosa purchased this plot, she was making quite an independent statement. The members of the Gretsch family who had died in America were all buried at the Evergreen Cemetery. This was quite a departure. February 29 The mortgage on Emily and Wilhelmina’s home at 670 Decatur was discarged. Emily and Wilhelmina must have been delighted to have paid off their morgage. I wonder if they had a party and burned the mortgage papers which was a custom. April 22, Mayor Strong signed the reform bill and centraized the school systemm of NYC. Rosa Gretsch, w Fred’k, musical instr. mf. 198 S. 4th Street, h. 20 Hart ST.
Louis Gretsch, wines, ny, h. 20 Vernon Ave.
February 19 At 3 a.m. Rosa’s mother, Caroline Schnappauff died at 20 Hart Street. She had been sick for 8 days with pneumonia. The death certificate was delivered to Mr. L. Gretsch. I imagine that this is Rosa’s brother in law and not her son. Her son would have been only 14. Caroline Schnauppauff was the only grandmother that the Gretsch children knew. She was buried at The Evergreens Cemetery along side her husband, Adolf who had died in 1887. There were two families living at 20 Hart Street at the time. After the death of her mother, Rosa, a widow with 7 children decided to supplement the family income by taking in boarders. Quite possibly it is at this time that Jacob Hyman, a retired businessman came to live with the family. There is no record of exactly when Jacob came to live in the family home at 20 Hart Street but a newspaper report states that in 1915 he had been living with the Gretsch family for almost 20 years. October 24 Jacob Gretsch, Emily’s youngest cousin from Mannheim died of Tuberculosis. Jacob was the youngest of the children of William and Anna Maria von Gerichten. He had come to America in 1884 on the same day as his older brother Philip. Jacob stayed in Brooklyn but Philip went on to California to be with the Von Gerichen side of his family. Jacob died at 247 East 24th Street in Manhattan. This is the home of Bena Gretsch Morgner and her husband Max. He was 30 years old. It must have been a very sad time for the Gretsch family to loose so many relatives in such a short period of time. Rosa’s mother died only months before. Jacob Gretsch was buried along side Rosa’s parents in the Evergreens Cemetery. It was the second time in less than one year when the children had visited this cemetery plot. Jacob was not buried with his brother Fred in the newly purchased Greenwood Cemetery plot. Dora and her friend. Dora is on the right. 1898 Van Wyck became a the first mayor of NYC won against reform candidate Seth Low (from Brooklyn). 1898 January 1, New York, Brooklyn and numerous towns and villages in the Bronx, Richmond and Queens became one consolidated city. Brooklyn schools were permitted to retain its peculiar local committee school system. Another family is living at the same address, perhaps they are renters. Julia Sumylar age 65, her daugher Caroline age 35 and another daughter Berenice age 24. Berence is the only one who is working. Her employment is “Stenographer, Advertising”. they are of Irish, English decent. At 1164 Halsey Street, Ralph Gretsch age 20 is living with his uncle Karl O. Jordan age 61. Frederick M.O. Jordan, son of Karl, age 23, is also living there. Karl is a architect. 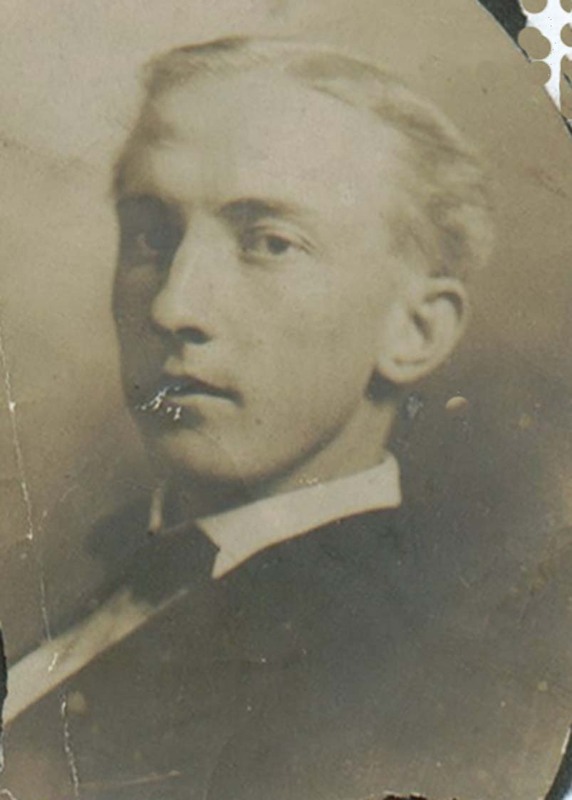 Herman Wintermantel, age 38, brother of Bertha and brother in law of Karl O. Jordan is also listed. He has no occupation. Bertha’s sister. Anna was married Karl O. Jordan. They were instumental in helping bring Anna’s mother, and her sister and brothers to America in the mid 1880’s. Dora referred to Anna and Karl as “Aunt Jordan and Uncle Jordan”. 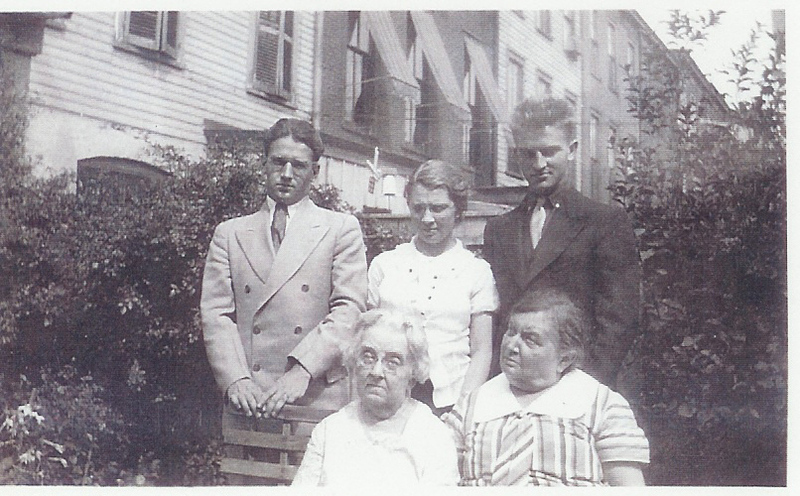 The US Census for Hoboken, New Jersey, shows Pauline Gretsch Benzing’s daughters living with their father and Emma Wintermantel and their three sons. Pauline is twenty years old and does embroidery. Wilhelmina is 17 and is at school. This is the last record of the daughters of Pauline Gretsch that I have been able to find to date, 5/2009. Emily must have kept track of them. She mentions only their names in her history of the Gretsch family. August 7 Emily’s half brother Ralph Gretsch is in Berlin with Max O. Jordon and applies for a US Passport. Ralph is 21 years old. Max is 25. They are cousins. Their mothers were sisters with the name Wintermantel. On the same day, Max O. Jordan applies for a passport in Berlin. They both give their addresses as 670 Decatur. Emily’s house must have been some sort of family hub! Revised Charter of School system, local boards revived. Nov.30 Burning of the Academy of Music on Montague Street, Brooklyn. December 19 On this Saturday, the Williamsburg Bridge was officially opened. There was a huge parade for the occasion and fourteen hundred policemen were on hand to keep order. William Cullen Bryant was the Parade’s Grand Marshall. Brooklyn Census shows that Emily and Wilhelmina and Dora and Ralph are living at 670 Decatur. Emily is listed as the head. Also living at that address are “Wallace W. Furse age 26, a Clerk and his wife Mattie, age 26 and occupation ” housework”. 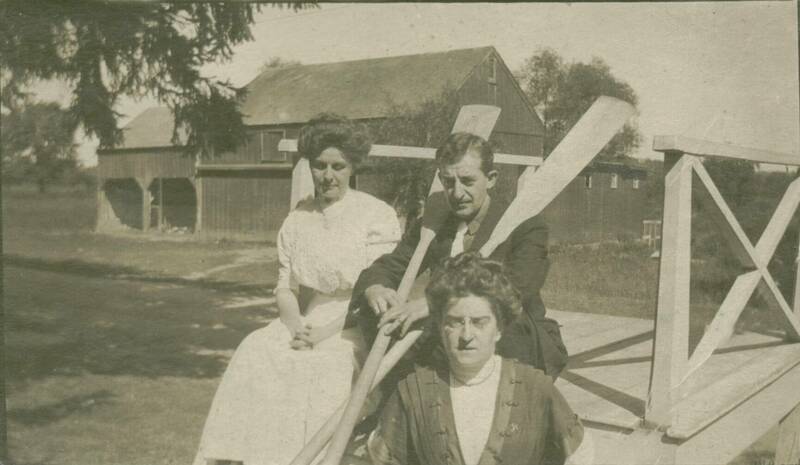 William C Gretsch and his wife Lucille with Dora Gretsch. 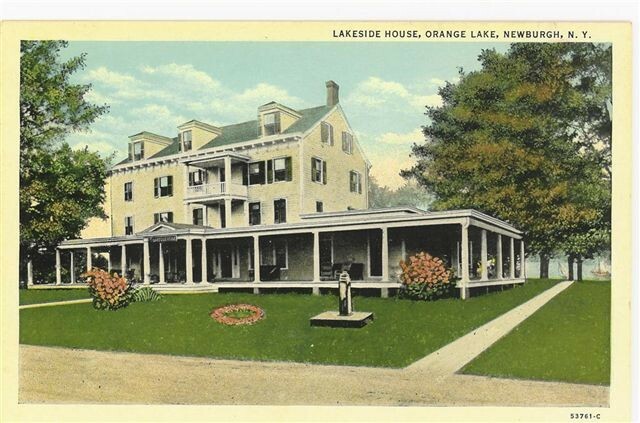 This picture postcard was addressed to Dora Gretsch, Lakeside House, Orange Lake, New York. The message read: “This fine looking crowd sends you love, Mill and Min.” Teddy, the son of Elsa Gretsch, gave it to me circa 1990. It was the first picture I saw of Hertha, Emily and Wilhelmina. There was no stamp on the postcard but perhaps it had been sent in an envelope. Or perhaps, it was never sent. That would explain why it was still in the possession of the Gretsch family and not in Dora’s possessions. Pictured here around 1906 or 1907 is Hertha, on the right hand side of the back row. Standing next to Hertha is her sister Helen and next to Helen is Elsa, the eldest Gretsch sister. The woman seated in the center is Emily (Mill) Gretsch. Next to her is her sister Wilhelmina (Min) Gretsch. 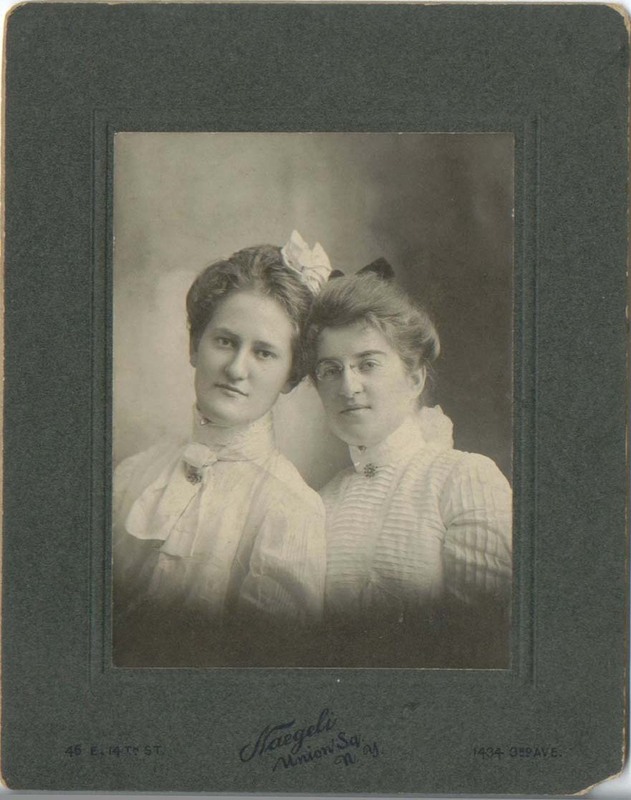 Emily and Wilhelmina were half sisters to Dora Gretsch. The father of all three girls was Jacob Gretsch. Emily, Wilhelmina and Dora were all born in Brooklyn and were first cousins of Hertha’s father, Fritz who was born in Germany. Hertha’s two brothers, Louie on the left and Herbert on the right complete the picture. In May of 2001, I gave the original postcard to Dora Gretsch’s daughter, Elsa Sitzer Francisco. “An electric railway from Newburgh affords easy and quick communication with New York.” from an ad in the Brooklyn Eagle, 1890’s. Above the picture is a postcard from the Lakeside House where the postcard was addressed to Dora Gretsch. Perhaps, this card was enclosed in a envelope and so it wasn’t postmarked. Maybe, it was never sent. Another picture of Emily, Wilhelmina, Helene and Hertha sitting by a lake was taken according to Ted Clauss at Red Bank, New Jersey where the Gretsch’s had a summer home. These pictures given to me by Ted show a real closeness between Emily and Wilhelmina, and my father’s aunts and uncles. I never knew of this relationship until Ted told me about it in the early 1990’s. December 13 Fred and Charlotte’s Gretsch’s second son Bill is born. Emily’s youngest sister Dora returns home from Europe. Dora was visiting with her friend Elfrieda. Elfrieda once lived in the neighborhood but returned to Germany to live. According to Dora’s daughter, they were very good friends. Perhaps, Dora was sent on this trip to help her forget her boyfriend, Dan Sitzer. Emily did not approve of Dan Sitzer. This picture of Dan was postmarked 1907 with both a Brooklyn and a Catskill postmark. It was part of a torn postcard. He looks very dapper. It was found among Dora’s pictures. Mr and Mrs. Max O. Jordan sailing for Europe. Perhaps, it is their honeymoom. June 14 Fred and Charlotte’s third son, Richard Gretsch born in Brooklyn. “All the water in the world wouldn’t clear me from this charge in the eyes of the Health Department. they want to make a showing; they want to get credit for protecting the rich ,and I am the victim”. 1909 Octo 2, Fulton-Hudson parade, 100 year celebration of the discovry of steam ship and Henry Hudson.hug parade in NYC. According to the US Census, both Ralph Gretsch and Max O; Jorden are living in Brooklyn, married and working with flowers. These cousins are still together. Elsa had remembered that someone was in the floral business but she couldn’t remember just who exactly. 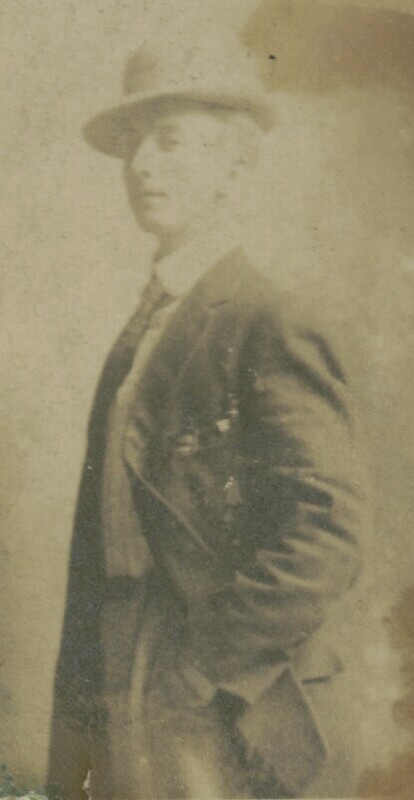 Picture of Dan circa 1910. Apparently, Dan and Dora kept up a correspondence even if Emily was unhappy with the match. This hand drawn and tinted picture of Dora was found among her pictures. Her first assignment was in Grammar School # 18, she later taught in Grammar school # 122 at Harrison and Haywood Street. James J. Reynolds was the principal there in 1913. November 7 Daniel H. Sitzer (28)and Dorothy M. Gretsch (32) applied for a marriage license in Detroit, Michigan. He was an assembler, she was a bookkeeper. Their witnesses would be Charles H. McCurdy, and John L. Edwards. Pastor Christina Christianson would perform the ceremony. November 28 Thanksgiving, Dora and Daniel were married in Detroit. Emily went to school at Public School No. 18 on Maujer Street. She also taught there. She must have known this man. 1917 Helped prepare Hertha for her trip to Hawaii and secretly for Asia. The US Census in Hoboken, New Jersey records that Hermann Wintermantel, age 58 is living with his sister, Emma Wintermantel Benzing, Emma’s hband Conrad and their four boys. Hermann is working as a porter for an Hotel. May 22 Emily Gretsch signed an “Affidavit for a relative” for her cousin Max O Jordan as he applied for a US Passport. Emily swore that Max was her cousin and that she had known him since he was 10 days old. She signed her name “Emily Gretsch”. Brother Ralph and wife Alice are living at 111-04 Puritan Ave, Forest Hills. This was not too far from where cousin Fred Gretsch lived with his three sons.Rosa Gretsch Kling was also near-by. Helene Gretsch Welsh and her husband were also near-by. 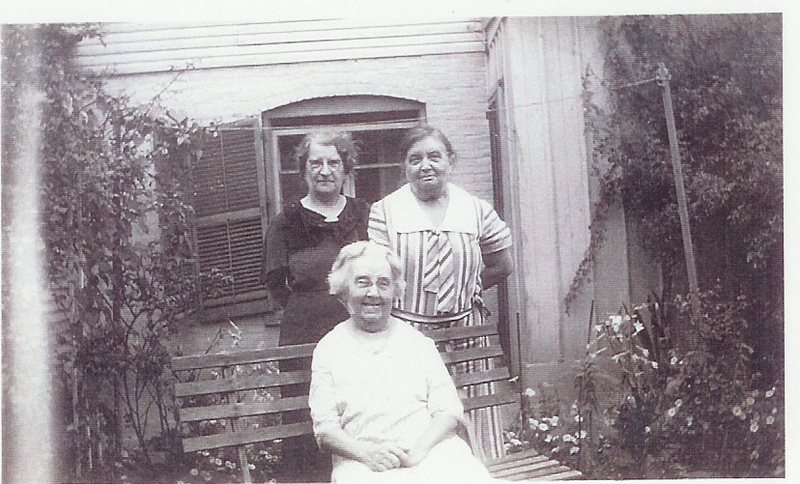 In the early 1930’s, Dora and her family went to Brooklyn to visit with Emilie and wilhelmina. According to her daughter Elsa, it was the first time that Dora had been back to her home at 670 Decatur Street since she left to get married in 1911. Pictures of the time show, show Emily, Wihelmina, Dora and her three teenage children, Dan, Elsa, Ed and their father, Daniel. Elsa remembers that their father had to sleep in a cot in the basement. the implication was that Emily and Wilhelmina never liked Daniel Sitzer. These pictures were most likely taken in the back yard of 670 Decatur Street. In the pictures from that day, a very attractive blonde woman was also present. She was also present in a picture of Emily some time later. In 1941, an older attractive blond woman, has sent to Wilhelmina a photo of her and her husband in a tropical setting. Is this perhaps, the same woman who was with Emily and Wilhelmina in earlier pictures? There was a beautiful hotel in St. Petersburg with this name but the relationship between this woman and Emily and Wilhelmina remains unknown. September 19 Emily Gretsch wrote her will. Max O. Jordan is the executor. He is a first cousin to Emily’s half siblings, Dora, William and Ralph. The witnesses are Eugene J.Keough and J. Vincent Keough. She signs her name “Emily Gretsch”. She leave $1.00 to her brother William C. Gretsch. She leaves the entire balance of her estate to her sister Wilhelmina. If Wilhelmina should die first, the estate should go to her sister Dora and her brother Ralph. The house on Decatur Street is valued at $52,000. January 3 The New York times reported that the Great Neck Garden Club would hold a meeting on the latest development of soil and hot bed management at the home of Mrs. Max. O. Jordan, on Wednesday at 2:30. The cause of death was chronic myocarditis, contributing cause was arteriosclerosis. She was 83 years, ten months and 3 days old. October Wilhelmina is living in Middleville with her sister Dora. I Wilhelmina T. Gretsch being duly sworn, says that William C. Gretsch was born at 102 Lewis Ave. City of Brooklyn, county of Kings State of New York on February 23, 1877. Sworn to before me this 3rd day of Ocotober 1938, Grace Long Hagadorn, Notary. This postcard gives a clue as to whom might have been a friend of Wilhelmina’s in upstate New York. This postcard belongs now to Tracey Annable, Dora’s great granddaughter. Thanksgiving Dora Gretsch’s daughter, Elsa Sitzer was married to Frank Francisco. Elsa tells me that they received a wedding present from Etta McCaffrey. The gift was a plate and Elsa was told at the time that this plate had a story. Perhaps, the story was about the break up of the house on Decatur Street. December 14 Wilhelmina T Gretsch residing in Middleville, and Dorothy Goeller residing at 850 Macom Street in Brooklyn, make an agreement. For the sum of $10 and other valuable consideration the party of the first part (Gretsch) grants and releases unto (Goeller) and her heirs…the property on Decatur Street. January 9 Just three weeks after the arrangement with the Dorothy Goeller, Wilhelmina moves into the Old Ladies Home in Mohawk, New York. She lived there until her death. Wilhelmina had with her in the “Old Ladies Home” in Mohawk, a black photo album. Elsa showed me this album in 2001 and told me that it belonged to her mother, Dora Gretsch Sitzer. Dora was Wilhelmina Gretsch’s half sister. Dora also lived in the same home for several years before her death. Elsa let me take the album home and study it further. I discovered from two postcards that were in the album that the album actually had belonged first to Wilhelmina. On the first page was a picture of Jacob. Below the picture, written in very old script in faded ink is the word “Father”. Wilhelmina and Dora had the same father, Jacob Gretsch. Opposite is a picture of a woman, Also written below the picture in very old script in fading ink is the word “Mother”. This however does not look like a picture of Bertha, Dora’s mother. Perhaps, it is Bertha but I tend to think it is Anna, Wilhelmina’s mother. Someone was keeping track of the Gretsch family in Brooklyn. July 26 In the early morning, Wilhelmina died at the age of 79 years, 2 months and 16 days. The cause of death was chronic nephritis, contributing cause was arteriosclerosis. Wilhelmina had had the condition for two years. Her ashes were later spread by the river along Creek Road and fishing Rock Road in Middleville by her sister Dora. After the death of his wife Alice, Ralph Gretsch came to live in Middleville with his sister Dora. He spread Alice’s ashes along Creek Road and Fishing Road Road in Middleville. July 16 Telegram sent to William C. Gretsch, Hotel Saint George, from Middleville. Ralph ashes were also spread along Creek Road and fishing Rock Road by the river in Middleville. Ralph was the youngest of all of Jacob’s children, he was born August 24, 1879. Dora died at the “Old Ladies Home’ in Mohawk, New York. She was buried next to her husband in the cemetery in Middleville, New York.